A strong start to Foundation's news service, Capitol News Illinois! 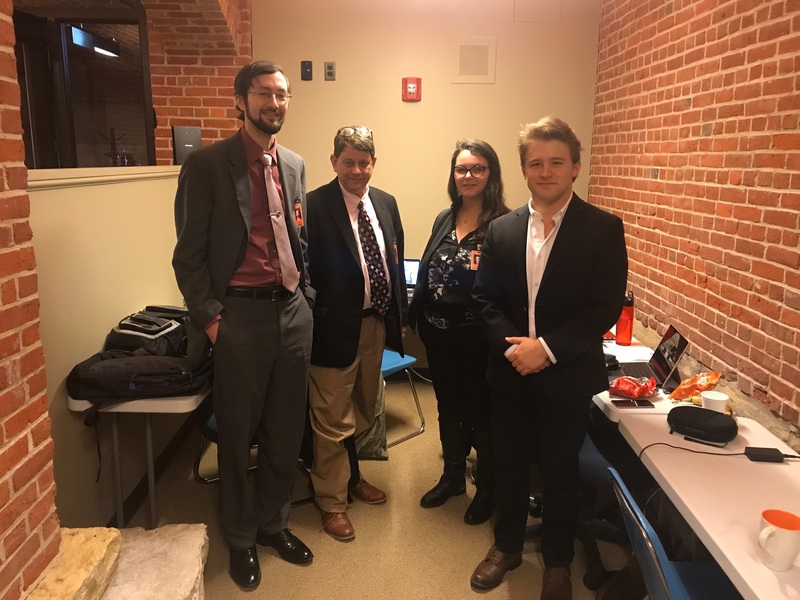 The Capitol News Illinois reporting team, (from left) Jerry Nowicki, Peter Hancock, Rebecca Anzel and Grant Morgan, pose from their temporary work space in the visiting media area of the Capitol basement. Capitol News Illinois has been reporting on state government for newspapers thar are members of the Illinois Press Association since Jan. 28. The news service is operated by the Illinois Press Foundation, with funding from the Foundation and the Robert R. McCormick Foundation. As I write this, the Illinois Press Foundation’s news service, Capitol News Illinois, is officially 10 work days old. Yes, there was a lot of work by many people in the weeks, months, and even years before Capitol News Illinois launched Jan. 28. And, yes, the Capitol News Illinois reporting team was on board and working before Jan. 28. But it’s been only 2 weeks now that the CNI team – full-time reporters Rebecca Anzel, Peter Hancock and Jerry Nowicki; and Grant Morgan, an intern from the University of Illinois Springfield Public Affairs Reporting program – has been producing stories and photos for newspapers across the state. And what a 2 weeks it has been! Through Thursday Feb. 7, Capitol News Illinois stories had been published in 134 newspapers. Of those, 38 are daily newspapers and 96 are weeklies. There had been 428 instances of Capitol News Illinois stories being published in Illinois newspapers. CNI stories had reached more than 800,000 subscribers of those newspapers. There had been more than 4.5 million total impressions of CNI content. The circulation of papers publishing CNI stories and photos ranged from 280 to more than 100,000. Honestly, I knew that we had brought in a very strong reporting team. Not only are Jerry, Rebecca and Peter very talented, but they care deeply about the Foundation’s mission with Capitol News Illinois. They all have previous experience covering or working in state government, and each enjoys talking about state government policies and procedures. On top of that, Grant brings the skills and a professional demeanor one wouldn’t normally expect from an intern. He’s ready for prime time! I also knew there was a real interest among newspaper leaders in Illinois to publish our content. There is a tremendous void in state government coverage in Illinois, just as there is throughout the country. There are really good journalists working in the Statehouse. There just aren’t that many of them. The Foundation’s mission of having Capitol News Illinois help fill that void was valid. In the first two weeks alone, Capitol News Illinois reporters sent 33 stories to newspapers that are members of the Illinois Press Association. They also sent four daily briefing packages – a feature we started at the request of a newspaper editor. And they updated the Capitol Recap daily so a current roundup could be picked up at any time of any day by an editor. They reported on legalized marijuana, a minimum wage increase that quickly moved through the Senate, a push to raise to 21 the youngest age someone could purchase tobacco products in Illinois, and more. There were some stories we wrote specifically because they were requested by an editor. So, feel free to make your requests. We’ll do the best we can to help! Our reporters have been busy, not only in producing stories but also in making contacts and establishing a presence around the Capitol. I and Peter Hancock will be appearing on the Sunday television show “Capitol Connection” on WCIA-Champaign in the next couple of weeks. The show’s host, statehouse reporter Mark Maxwell, hopes to have our Capitol News Illinois reporters on the show with some regularity as panelists talking about state government. That kind of exposure is very positive! Not too long before the launch, we agreed on a logo for Capitol News Illinois. The logo has been sent to newspapers to publish along with our content in print and online. It will be featured prominently on the Capitol News Illinois website, which we expect will go live this week. Editors will be sent information about how to access our website as it is launched. At the outset, Capitol News Illinois content has been emailed to editors and publishers. As each story is ready for publication, it is sent out as a Word document and also in the body of an email. Photo links are attached in the email, and captions are included. All content also has been posted to the Illinois Press Foundation’s website, illinoispressfoundation.org. Editors and others who request them are receiving daily emails with our coverage plans for the day. That helps them know what to expect in terms of content and when it will be available. In addition to the logo and website, another milestone for Capitol News Illinois has been becoming a member of the Illinois Legislative Correspondents Association. This leads to having office space in the media area of the Capitol basement. For the first couple of weeks, our reporters have been working from the tables in the visiting media area of the basement. It’s far from ideal, but it has worked. It will be nice for our reporters to have their own office and work space. Quarters will be tight, however. We’ll be sharing space with the Chicago Daily Law Bulletin and the Illinois Times. There are many other things that already are being discussed to grow Capitol News Illinois. I can’t say anything about them now, but I look forward to sharing good news of progress as they happen. In the meantime, our team will continue to work hard, improve, and increase our reach through newspapers across Illinois!